I was away in the North of France this weekend (for the wedding of a God daughter) and when I returned to Paris, the weather was absolutely stunning. 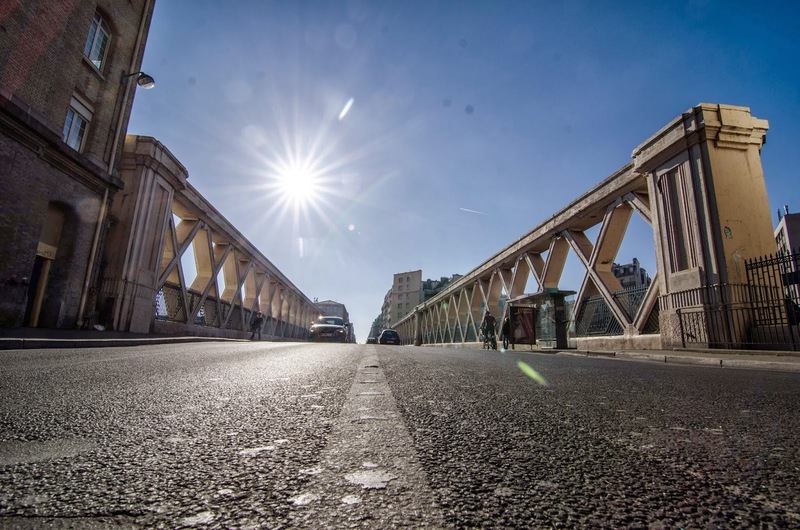 I took this photo in the rue Lafayette on the bridge that allows the cars to go over the tracks of the Gare du nord. Today to fight pollution, the authorities have decided that only cars with an odd number on their licence plate could run. Wow! Are scooters facing any restrictions? I wonder if Paris will go the way of London in terms of offering a tariff to drive into certain zones in the city? It was so nice to be out an about in DC on Saturday, but now it's snowing! Hope the sun stays with you this week. Well... this tariff thing is more and more in the news in France.... I'm not looking forward to it though. Snow in DC?! Brrrrrrrrr! I don't know how you managed to get the exposure so well when shooting directly into the sun, but it's great. I like those rays coming off the sun too. I must say my camera is very good at handling that. "That's an odd idea" Ha ha! Interesting to notice that single bicyclist and lone pedestrian. Perhaps this was shot early in the morning. I have biked back and forth to work for over 40 years here in Chicago. It was a lonely pursuit up until around 2008 when the depression hit. Chicago is getting much more bike friendly, but far from becoming able to claim victory. Never the less, this is quite a striking photo in terms of lighting and angle. What are you doing lying down in the middle of pavement! Oh well, we already are familiar with the Tenin view point and his daring do to get a photo at all costs for all us dedicated PDP fans who truly appreciate the effort. Stef, in chilly Chicago, wondering if Spring will ever return! LOL. Yes spring will return! It always does! Paris is more and more bike friendly too. And sooner or later they will only allow electric vehicles in the very center. I'm sure. Terrific picture! I was reading in the NY Times all the measures Paris is taking to try to deal with the pollution problem. Hope they work! It apparently did a bit (even though they say that only 18% of the pollution comes from cars...). The pollution issues in Paris have made the news here as well.